Imagine walking into your favorite bookstore and buying a new book. You bring it home, read it, and decide that it's a pretty good book. It just needs a few changes. You type the whole thing out on your computer and add a few things, and maybe you leave out a few things you didn't like. Then you decide to send the whole thing to a publisher to see if they'd be interested in publishing your new book. Does that sound a little outrageous? Of course, you'd never do that with a book, because that book isn't your own work or your own idea. So why does it make it any different if that idea is a beading pattern? Understanding your rights as a beader and as a designer of beading patterns is so important, yet there seems to be so much misinformation out there about this subject. Take for example a video that made the rounds in the online beading community last year where a nameless, faceless woman pointed to a beading pattern published in a magazine and informed viewers that once the pattern was published, buyers of the magazine were free to do whatever they wished with it, including making and selling copies of the finished beading project without the designer's permission. Protecting intellectual property rights is no laughing matter to the entertainment industry. Film studios and recording studios spend millions of dollars every year protecting their intellectual property rights. After all, they make their money turning creative ideas into finished products, just like a beading pattern designer would. What is copyright, and how does copyright work? Can I resell a pattern, magazine, DVD, or book that I own? Can I make and sell projects from a magazine or book? If I create my own beading pattern, do I always retain the copyright? What can I do if someone is violating my copyright? 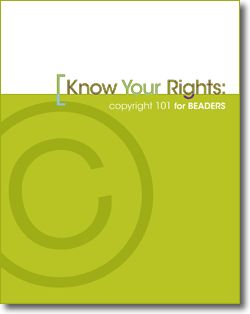 Download your free copy of Know Your Rights: Copyright 101 for Beaders and find out how you can protect your intellectual property rights, and how to best respect the rights of bead artists. Understanding copyright and intellectual property rights is how we build a healthy and creative beading community!